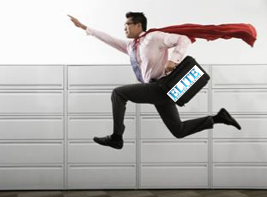 it's a bird, it's a plane... no it's "Process Service Man!" People often ask me why I do it. If I were to say it’s just a job, something to pay the bills, it would be like saying skiing is just a way to get down a hill. There are a lot of easier ways to make a living. Process servers aren’t the leading men (or women) of our legal system. Courtroom dramas don’t begin with our hero serving court papers. When we do get on screen, most of the time we get a part that fits an old cliché: the clever tricksters who suddenly materialize to sneer, “gotcha!” Or when process servers are featured, it is a wildly unrealistic portrayal of what we do. I am a process server because of the adrenaline rush that comes when every sense I have is alert to my surroundings. As much experience as I have, I know better than to approach any assignment as though it were routine. This does not mean I gear up for a confrontation. A good process server knows how to avoid escalation. I enjoy serving papers because I do help to bring justice and right many wrongs. The integrity of our legal system is built upon verifiable procedures; otherwise it would boil down to chaotic gamesmanship. The serving of process represents the the court system stepping in as the referee to countless legal disputes, ensuring that people, weak and strong alike, have recourse when their rights are violated. I am fortunate because process serving in Colorado is an ideal way to travel through every corner of this beautiful state. I have a job that doesn’t follow a typical nine to five day in which I am tethered to an office that might as well be in any part of the country. I get the chance to really see Colorado: whether by looking up from the foot of one of its carved mountains, or by looking down upon a colorful valley floor. I have driven through towns that put postcards to shame, places that are framed by rushing waterfalls and punctuated by soaring eagles. Every day is new and exciting. When you hire someone, you want that person to not only be good at what they do; you want them to be enthusiastic about doing it. Most of the time, one trait cannot exist without the other. One of the reasons we started this blog is to show that process serving is more than a valuable profession, it is an adventure.